The taste of food changes as one gets older. Considerable differences exist between an elderly person and a younger person in regards to sensory perception and pleasantness of food flavors and taste. Salt and bitter taste acuity declines with age, but sweet and sour perceptivity does not (Methven L. et al., 2012). Olfactory acuity also declines with age. The sense of smell is more impaired by aging compared with the sense of taste. These changes affect an older individual’s food preferences and choices, appetite, dietary intake, and nutritional status. As one ages, the body goes through changes that are triggered by both the aging process and alterations in health, nutrition, sleep and exercise that affect the body at the cellular level. These changes affect the sensory system of the body, and can impact an individual’s dietary intake. Older people slowly lose their sense of taste and smell, affecting how much they eat and the kinds of food they choose. Changes in smell and taste can affect food preferences. Food can become tasteless and unappetizing as a result of declining taste and smell perception. If food doesn’t taste appetizing or smell appealing, it is likely it won’t be eaten. Recommended changes in diet such as limiting intake of salt, sugar or fat, can also lead to lower food intake. 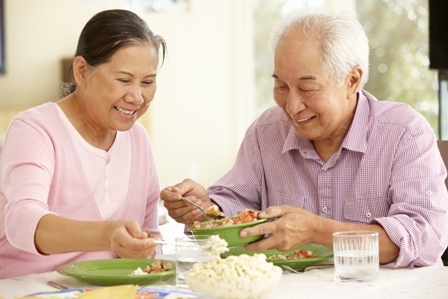 Elderly should be encouraged to add seasonings to their food instead of relying on excessive consumption of salt and sugar to give their food flavor. Taste helps us detect spoiled food or liquids; a problem with taste perception can weaken or remove this early warning system. 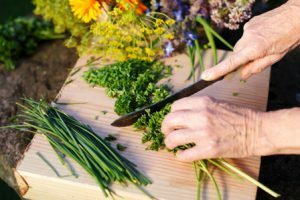 A distorted sense of taste can also be a serious risk factor for illnesses that require sticking to a specific diet for example loss of taste can cause one to eat too much sugar or salt to make food taste better, which can be a problem for people with such illnesses as diabetes or high blood pressure. In severe cases, loss of taste can lead to depression. Taste and olfaction disorders should be considered a part of the aging process. Loss of taste does not happen drastically with age. Instead, it begins around middle age and continues to decline through the remainder of life. The tongue has approximately 10,000 taste buds that are responsible for differentiating sour, sweet, salty and bitter tastes. That number of taste buds begins to decrease beginning at age 40 in women and 50 in men. Sensitivity doesn’t begin to decrease until after age 60. As one ages, and produces less saliva, dry mouth can also affect the sense of taste. Changes in the function of taste can also result from prior upper respiratory infections, head injuries, medication use and other idiopathic causes more common in the elderly, such as tooth loss and dentures. Individually, each taste bud goes through a constant cycle of birth, death, and rebirth that lasts about two weeks. A healthy tongue sloughs off and regrows these taste buds constantly. With the onset of middle age, the taste buds continue to die and be shed, however a smaller number regenerate as the years go on, contributing to fewer taste buds in the mouth, and consequently flavors begin to taste blander. Loss of taste or changes in taste are often localized to one area of the tongue and not the whole tongue. Taste and smell are interconnected – the decline in ability to smell and differentiate smells influences taste perceptions. Sense of smell declines once we hit middle age; there is ongoing research to explore the neuroscience behind these changes. Decline in smell can be attributed to a decrease in the number of nerve fibers in the olfactory system. Even without an illness or disease, age can trigger a decrease in the effectiveness of the nerve cells. A reduced number of cells and reduction in sensitivity of those remaining cells, results in a change in the ability of the individual to interpret smell, which in turn impacts taste. Food and beverages targeting older individuals should offer flavors that are more appealing to their taste preferences, they should utilize higher intensity aromas in certain cases and lower intensity of others, with varying textures and smaller portion sizes to accommodate the changes in taste, smell, appetite and food preferences. Satya Jonnalagadda, Ph.D., MBA, RD has a strong Human Nutrition and Foods background in research, education, and clinical care, with areas of expertise including, chronic diseases treatment and management, specifically Cardiovascular Disease, Diabetes, and Obesity; Sports Nutrition, and Critical Care Nutrition.